Origins has done amazing things for dogs we know and love! 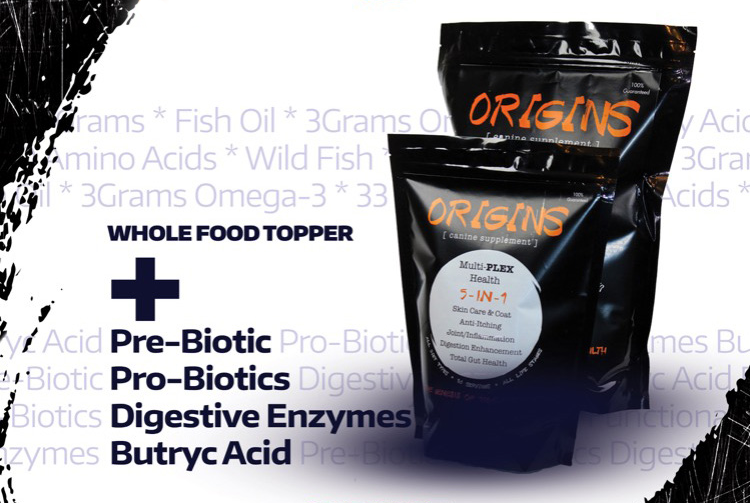 Origins is a ground-breaking supplement that provides a beneficial and highly digestible protein source (92% digestible) to support the health and performance needs of your dog. The natural oil properties of the Omega-3 fats found in the Menhaden fish protein used in Origins provide essential fatty acids to boost conditioning of the skin, coat, joints and gut health. Origins contains digestive enzymes that assist the dog in digesting raw-diet ingredients or kibble-based food. Thus more energy is extracted from the food to keep and maintain a net positive energy state. The role of prebiotics and probiotics are not forgotten! Both are included to provide proven synergistic benefits focused on supporting a healthy gut environment. Butryric acid – a true advancement in canine nutrition – is included to help restore the gut wall lining, aid increased immunity and to jump start the shift to positive gut health by supporting prebiotic and probiotic functioning.